A century ago the Battle of the Somme had come to an end. 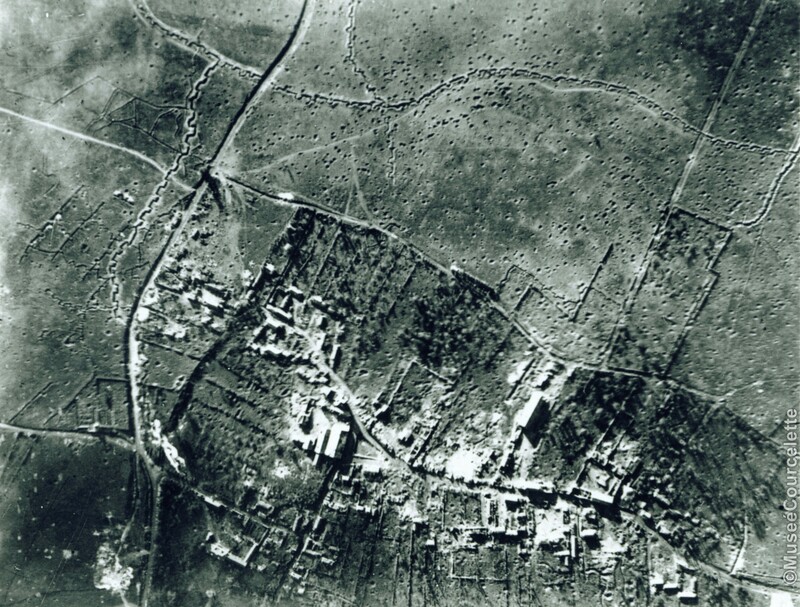 The scale of fighting had been drastically reduced since the last major attack on 18th November, but there was much ‘localised’ action after this, often not always recorded in the pages of the official histories. Gradually the weather worsened, and the winter of 1916/17 turned into the worst of the war, with temperatures dropping to minus 25 on the Somme front. For us a century later it seems as if the Somme is over. 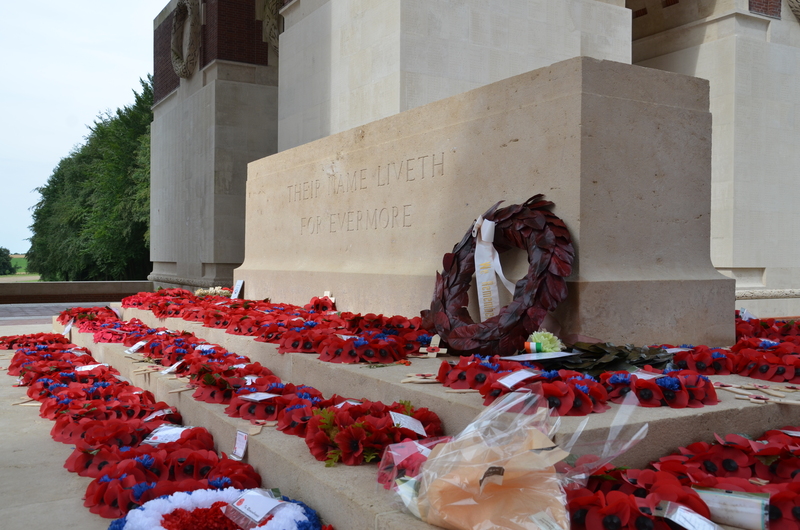 The centenary has passed, the people who have visited this year returned home, and the battlefields quiet once more. But of course they are never truly quiet, if we chose to listen. The Somme was a turning point not just in the war but in Britain’s history and interest in it will never fade away. Somehow we will always return to the Somme, and that is just as it should be. 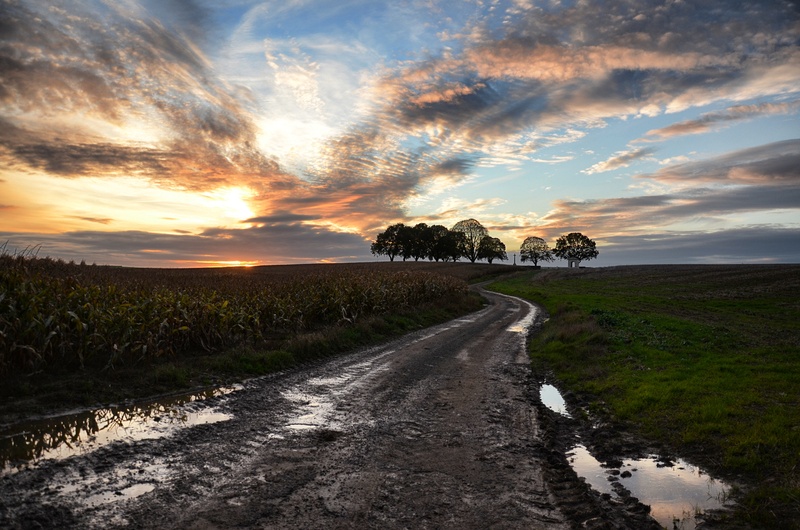 And of course the Somme’s story is far from over; the war came back to Picardy in 1918 with the German offensive that swept across the ground in the spring, through to the beginning of the end of the war with the breakout on the Somme in August 1918. A century ago today the men of the Canadian Corps made an assault on the village of Courcelette as part of the Battle of the Somme. This was a battle of firsts for Canada: it was the first time the Canadian Corps had led an attack, it was the first time anyone had gone into battle with tanks, it was the first time Canadian troops had liberated French soil and a French village, and symbolically it was the first time the French-Canadian 22nd Battalion Canadian Infantry had gone into battle, to help liberate that village. 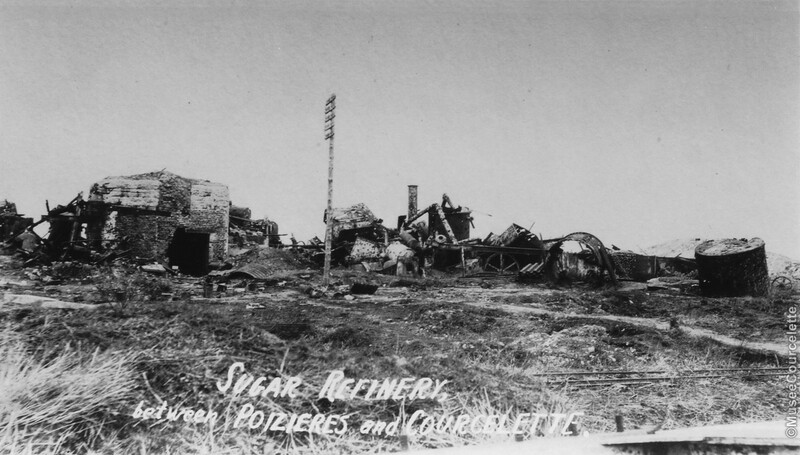 The village was captured with the assistance of those tanks, especially in the area of the Sugar Factory. And while Courcelette was taken on this day, the Canadian Corps would remain here for the next two months battling for positions like Zollern Graben, the North and South Practice trenches and finally Regina Trench and Desire Trench. By the time Canadian units pulled out in November 1916, more than 24,000 Canadians had become casualties: more than 8,500 of them killed and of them, over 6,000 missing – half of the names on the Vimy Memorial commemorate men who died at Courcelette. But for Canada, Courcelette is a forgotten battle. 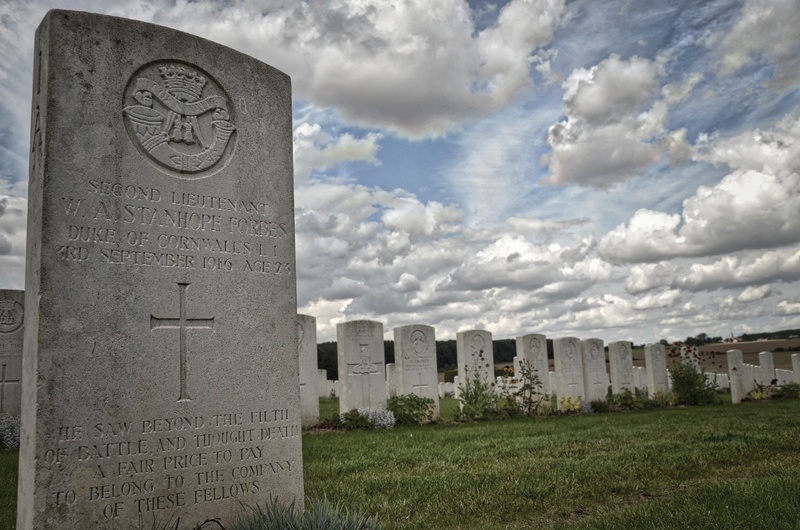 Despite its symbolic position in the history of the Canadian Expeditionary Force, despite the huge scale of the missing, few Canadians visit the village and the three cemeteries that surround it: Courcelette British Cemetery, Regina Trench Cemetery and ADANAC Cemetery… ADANAC is Canada spelt backwards. Canadian education groups and Canadian battlefield tours come to the Somme every year but they always visit the Newfoundland Park at the expense of Courcelette: which while the park is now run and maintained by Veterans Affairs Canada, it has no connection to the story of Canada in WW1 as the Newfoundland Regiment was part of the British Army, and Newfoundland itself was not part of Canada until after WW2. Even the local tourist authorities on the Somme invariably describe the Newfoundland Park as a “Canadian Battlefield”. Meanwhile the fields around Courcelette remain silent. Today a handful of people will remember Courcelette, in the village and the cemeteries. There will be no big official ceremony, and possibly no official Canadian representation. A century on, Canada’s knowledge of the Great War is still over-dominated by Vimy Ridge and Canada’s sacrifice on the Somme in 1916 sadly appears to be a footnote in that war when it should be so much more. On this day a century ago a new type of warfare began: the use of tanks. Tanks had originally been developed by the Navy as ‘Landships’ but the Army had taken over their use and development, and by midway through the Somme campaign they were at last ready for use. The name ‘tank’ was adopted because as they were being developed they had been described as ‘water tanks’ for Mesopotamia. At this stage of the conflict tank units were part of the Heavy Branch Machine Gun Corps, becoming the Tank Corps in July 1917. On 15th September 1916 British and Commonwealth forces attacked on a wide front on the Somme from Courcelette on the left, to the area close to Combles on the right. 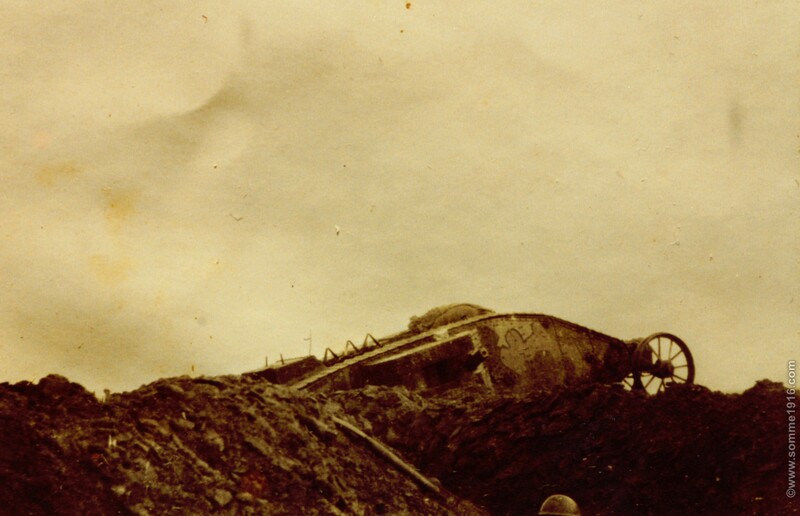 More than thirty tanks were employed, with many breaking down even before they could go into action and once on the battlefield, often with mixed results. However, there were some major successes at Courcelette and Flers for example: at Flers the national press proclaimed that a tank had moved down the main street with the whole of the British Army behind, cheering! Images of the first use of tanks on 15th September 1916 are rare and these come from a small album owned by a New Zealand soldier and are in the possession of my good friend Geoff Bridger, himself a published WW1 historian, who loaned me them for my Walking the Somme book when it first appeared in 1997. They show two different tanks, a Female armed with Vickers Machine-Guns and a Male, armed with 6-pounder guns. The superb First Tank Crews website shows that these tanks were from D Company . The Female tank may be D10 commanded by 2/Lt Harold Darby and the Male tank is either D11 or D12. All these tanks ditched while in action. 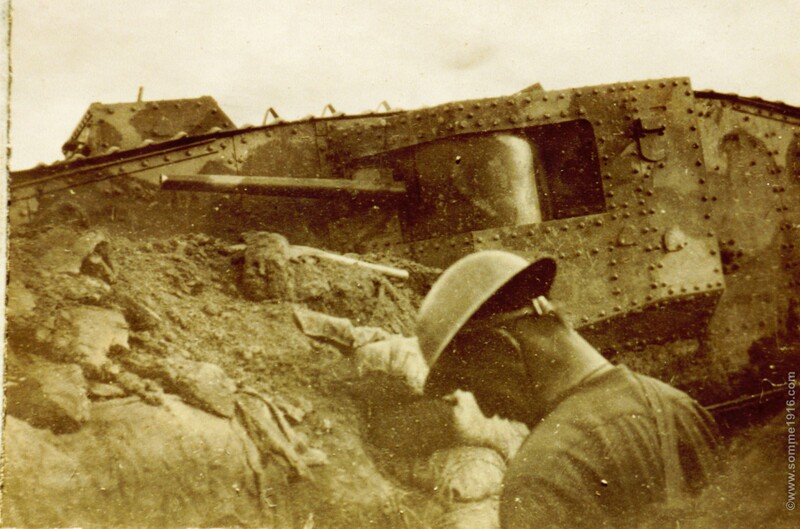 Today we remember those first tank crews in the first action of the ‘Boilerplate War’. 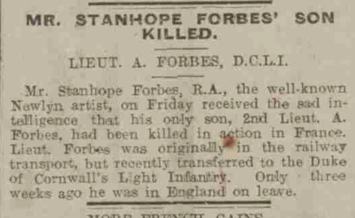 William Alexander Stanhope-Forbes was the son of Stanhope Alexander Forbes, a Royal Academy artist and part of the famous Newlyn School of artists. Over the years I have searched to see if this was something he had copied, but it appears he wrote it himself: for me, perhaps the most moving and profound inscription on any wargrave, anywhere. William Alexander Stanhope-Forbes began his war as a Railway Transport Officer (RTO): one of his relatives ran the London and Brighton Railway, but his own background was as an architect. His early life had been tragic; he had been ill as a child and his mother had died in 1912. In 1914 he had tried to enlist but was rejected on account of his health but had managed to get the job as an RTO in England, determined to do his bit. But by the summer of 1916 he was posted to the Duke of Cornwall’s Light Infantry and arrived in France on 16th August 1916. He was killed in action going over the top in his first battle only a few weeks later on 3rd September 1916. 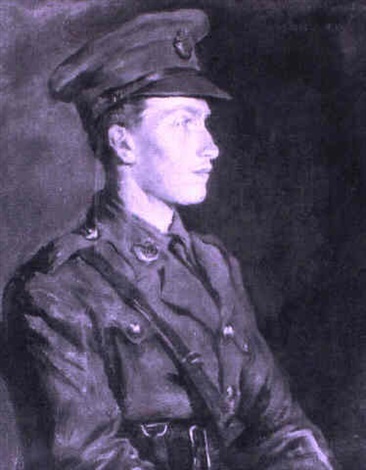 William Alexander Stanhope-Forbes lives on at the Architects Association School of Architecture where an annual prize is given in his name, and the inscription on his grave continues to move visitors to the Somme battlefields. The author and historian Lyn MacDonald was one of a handful of writers in the 1970s and 80s that in many respect helped to revive interest in the Great War. At times I think we forget what a debt we owe these authors from that period who often worked in isolation, with virtually no public engagement or interest in what they did. 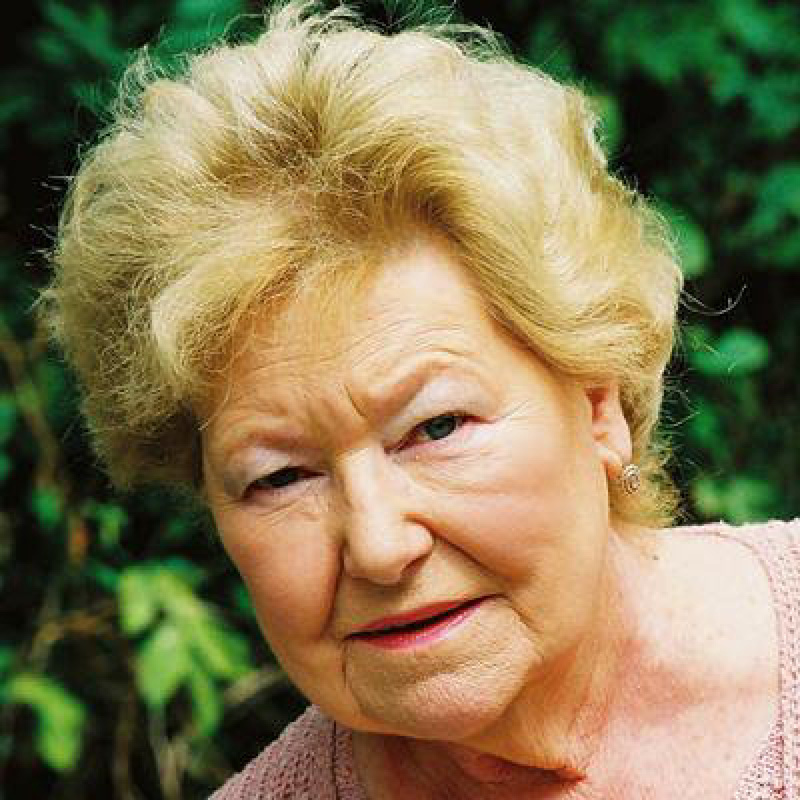 Their work is a lasting legacy, and while many criticise Lyn MacDonald’s work as ‘just’ oral history, the voices of the men and women she interviewed would have been lost without her. In my own mind works like this Somme book have become WW1 ‘classics’. This interview dates from 1983 when her book on the Somme came out. I was only sixteen at the time and I recorded this from the radio, in eager anticipation of the book appearing. I have the copy next to me now; given as a birthday present by my grandmother who had herself witnessed chalk covered soldiers returning wounded from the Somme in her home town of Colchester. She told me she couldn’t read the book as it brought back too many painful memories. Lyn MacDonald is retired now and perhaps will never write another WW1 book again, and part of me feels sorry that she existed and worked in a time before social media and the current public fascination with the Great War, because I know she would have embraced it somehow. 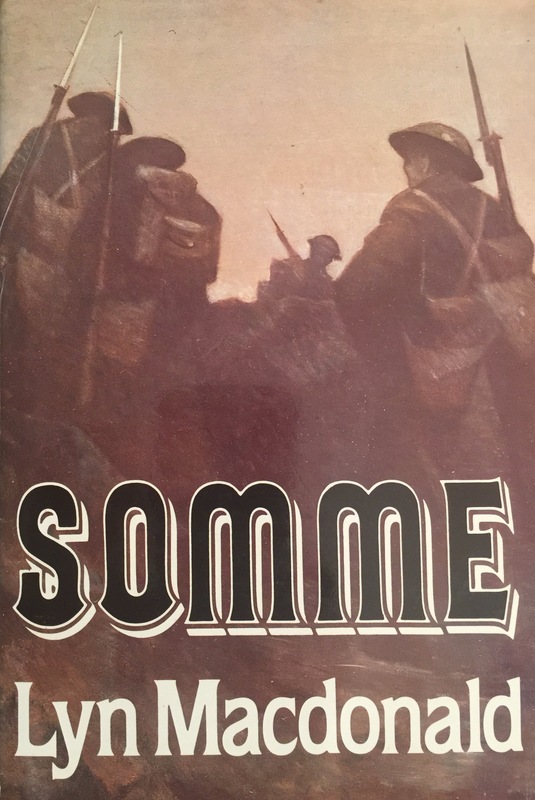 But her books continue to capture the interest of new generations who come to the subject and the Somme is still in print, and no author could ask for more. Courcelette British Cemetery is one of three Great War Cemeteries in the village of Courcelette, a location captured by the Canadians on 15th September 1916. Many of their dead from this period are buried here, along with Australians from Mouquet Farm and Pozières who fell in August-September 1916. 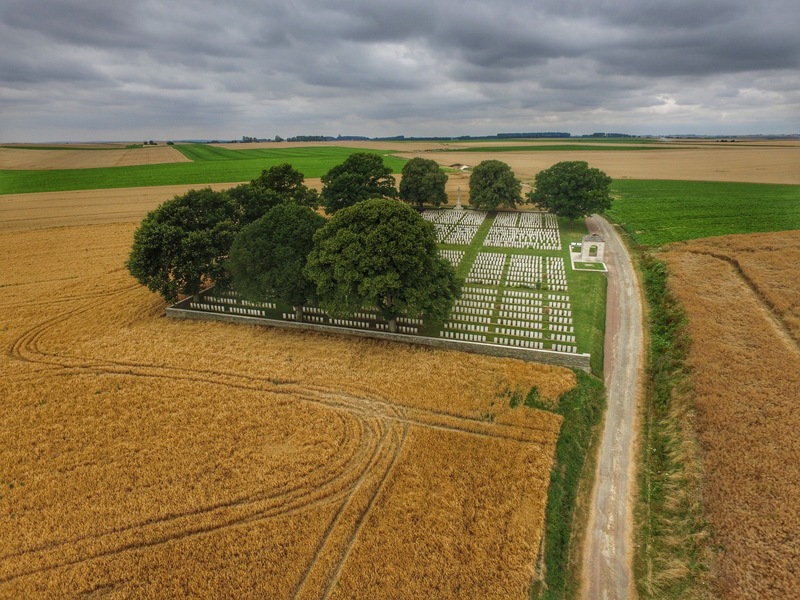 The British dead in Plot 1 are the original burials made when Courcelette was just behind the British front line at the end of the Battle of the Somme. This is a large format book, and holding it and just flicking through before a proper read, one thing is quickly apparent – this is a quality publication. It really is a handsome, attractive book to hold and the images inside are stunning. Everything about it speaks quality and once you start to read the text this is confirmed even further. Peter Doyle and Chris Foster have already produced some fine works about the Great War and this is certainly one of their best so far. 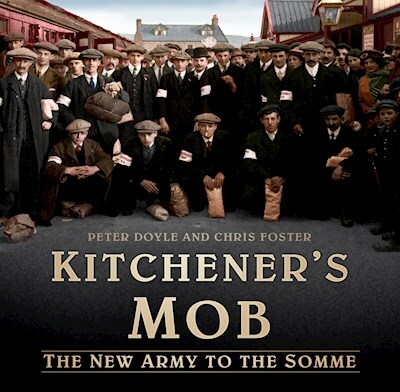 It looks at the men who joined Kitchener’s Army – Kitchener’s Mob – in 1914, their road to war and their training, the story of the Pals battalions and then their march to the Somme in 1916. Throughout there are well chosen contemporary illustrations and fantastic modern photographs of ephemera, uniforms and equipment. This is a real tour-de-force of what Kitchener’s Army was all about a century ago, and is not only a moving memorial to the men of the Somme, it is so finely crafted and presented, it really should be on the shelves of anyone with an interest in the Great War. Essential reading, absolutely essential reading. Available from the History Press website.